Is Stallone Finished with Rocky After the Huge Success of Creed 2? We might have finally seen the last of the Italian Stallion. Last week, Creed 2 knocked out the box office by becoming the highest-grossing live-action movie to be released over the Thanksgiving weekend. Starring Michael B. Jordan as Adonis Creed, the movie also sees Sylvester Stallone reprise his franchise role as Rocky Balboa, serving as a mentor to the titular boxer. Rocky also deals with his own family drama in the movie, and as far as Stallone is concerned, the character's story has now been wrapped. Even if Adonis goes on to box again in another sequel, Stallone posted a video of himself speaking on Instagram suggesting it won't be under the guidance of Rocky. "Well, this is probably my last rodeo because what I thought happened, and has happened, I never expected. I thought Rocky was over in 2006 (Rocky Balboa). And I was very happy with that. Then all of a sudden this young man presented himself and the whole story changed. It went on to a new generation. New problems. New adventures. And I couldn't be happier as I step back because my story has been told, there's a whole new world that's going to be opening up with the audience, with this generation." 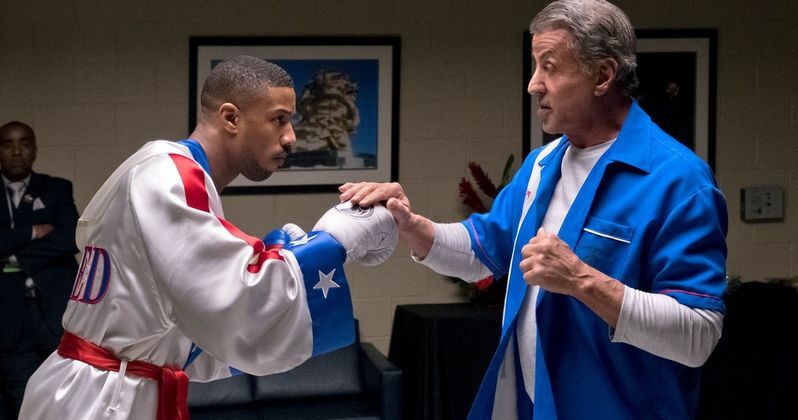 Sylvester Stallone co-wrote the screenplay for Creed 2, and perhaps he used the opportunity to tie up every loose end with the Rocky character. While not saying point blank we will never see Rocky again in another movie, Stallone seems convinced his time as the Italian Stallion is over. Perhaps a solid enough idea for a third movie will help convince him to return, at least in the form of a special cameo. However, even if this really is the last time we'll see Rocky, all is just as well. His involvement in Creed 2 was spectacular and it's fitting for Stallone to take the character out on a high note. Given the success of the movie, we are more than likely to see Michael B. Jordan back as Adonis Creed once again. Even without Rocky, there are many creative directions to go in the inevitable follow-up. Creed 2 director Steven Caple. Jr. says he even considered a story that would bring back Mr. T as Rocky III antagonist Clubber Lang. At this point, however, Jordan's Creed is such an amazing character that he won't need any returning personalities from the series to have an interesting story. Perhaps it will be more intriguing to see him take on a completely new kind of foe the next time he steps into the ring. It's been quite the ride for Rocky Balboa. Starting with the first movie back in 1976, Stallone starred as the character for five consecutive movies. Because 1990's Rocky V wasn't quite as well-received as its predecessors, that seemed to be the end of the road for the franchise for many years. Sixteen years later, that would change when Stallone resurrected the role once again for Rocky Balboa. Critically acclaimed, this movie by itself did an excellent job in concluding Rocky's story. Seeing him come back for Creed and its sequel was also unexpected, but it's done wonders in setting up the franchise to continue with its new lead character. Creed 2 is now playing in theaters everywhere. Stallone does incredible work in the movie, but it may be bittersweet knowing it's his last rodeo as Rocky. At least he'll still be playing John Rambo one more time in an upcoming movie as well. You can watch Stallone's Instagram video below. Stallone Says Goodbye to Rocky, Is the Character Gone for Good? Will Creed 3 Bring Back Mr. T as Clubber Lang?